I hear the phrase "it has only been ___ weeks" over and over again from the pundits this time of year. Yes, it is early, and yes, early September excellence is no promise of similar results in December. We get it. But, we also know that we can only collect and analyze evidence that exists. And in 2014, we have 4 weeks of material to dissect and sort through. The findings are quite interesting from a Dallas Cowboys standpoint. As we mentioned yesterday, the Cowboys have run the ball more than anyone (130), they have more yards than anyone (660), which in turn equates to the most yards per game by anyone (165 per). But, we did not mention that the Cowboys are 7th in 1st half runs, 2nd in 1st and 10 runs, and 3rd in overall run percentage with 51%. Yes, their run/pass balance is actually 51/49. There is no way that is sustainable, but who ever thought we would see this for even 4 weeks? Here is another one for you to ponder: The Cowboys are #1 in the NFL through the 1st month in 10-yard runs. They are also #1 in the NFL in 20-yard runs, but since there are so few of those, I like the volume of numbers that separate the league in the 10-yard category. Here is a chart that shows how bad the Cowboys have been at this category over the last 4 seasons. 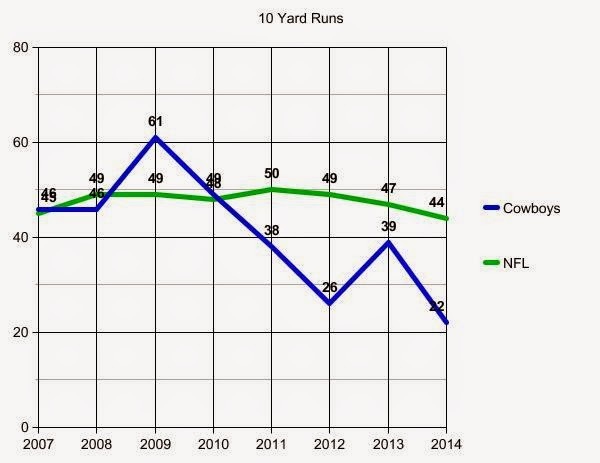 Basically, while the average NFL team has about 195 10 yard runs, the Cowboys have 152 from 2010-2013. That shortfall of 43 is substantial and demonstrative of a team that simply was so discouraged by its own running situation that they almost stopped trying altogether. Well, the investment in the offensive line is proving to be an amazing development that is making everything better. The Cowboys are already using Play Action at a rate that is off the charts for a Jason Garrett/Tony Romo offense, and that only works over the long haul if you have a proper run threat that is troubling the defensive brain trust. Well, look above at that blue line. I included 2014 (the green line in 2014 is the PROJECTED league average only), even though it is an obvious misrepresentation of the season because THEY HAVE ONLY PLAYED 4 GAMES! That is right, the blue line is almost already at the 2012 level, and is well beyond half way to 2011 and 2013. Can they keep up this pace? Who knows. But, even if they don't, they will destroy pretty much every year on this chart by simply playing league average the rest of the way in. The whole objective of the zone blocking scheme is to create a seam. However, the defense plays a role in selecting the seam. You move them (often laterally) and when one of them breaks their form, you use it against him and turn block him from the play. In this case, Ronald Leary does it to #94 - Cameron Jordan. 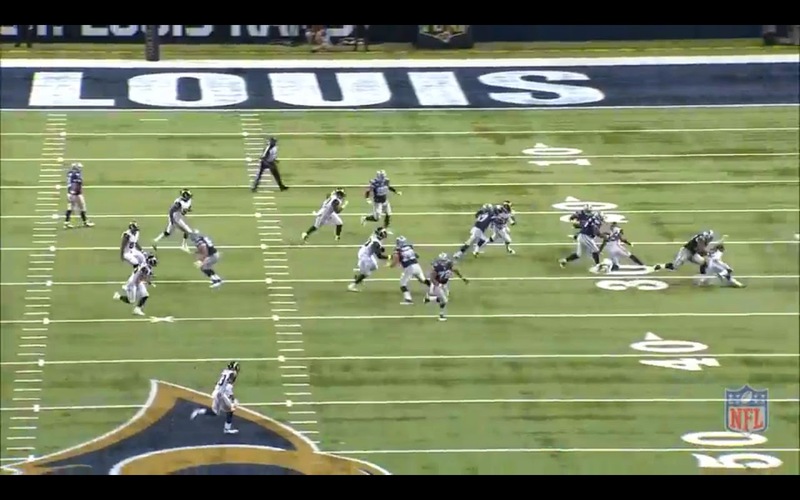 Then, Tyron mows out 93-Galette with a small amount of assistance from Witten. That leaves the combo block with Frederick and Martin on the Nose tackle. If you notice, the combo block is not because Martin cannot handle the block on his own. Rather, it is done by Frederick to allow Martin a chance to step over and get leverage that he didn't have at the snap. If Martin tries to block 95-Deaderick without Frederick's help, the angles are wrong. So Travis pops him back towards Martin, then once Martin is in position, Frederick leaves to go clean up #50-Lofton at the 2nd level. You seriously cannot do it better than this. The first time Murray is actually touched is at the 7 yard line - 21 yards down the field. 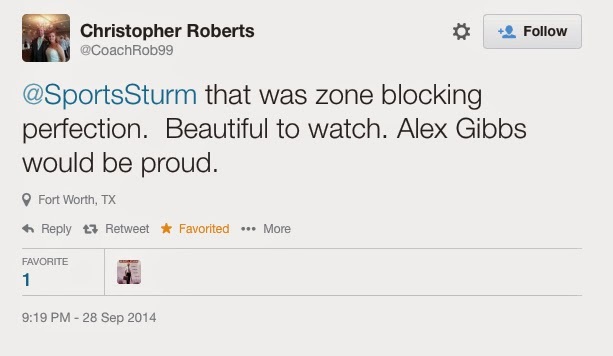 And as this area high school coach tweeted me, it is perfect. Offensive Participation: In this game, the perfect attendance of the 7 who are "always on the field" continued: Smith-Leary-Frederick-Martin-Free-Witten-Romo. They are each now 277 for 277 on the season. If that continues, the team success is bound to continue as well. Next up are Dez Bryant, DeMarco Murray, and Terrance Williams playing most of the rest of the snaps. So, that generally leaves 1 spot that is swapped between Cole Beasley, Gavin Escobar, and James Hanna from play to play. Lance Dunbar and Joseph Randle combine to play 10 snaps and try to give Murray a brief spell. Otherwise, this is an offense that has had great health and they certainly hope to keep it that way. All snap numbers courtesy of PFF and they include all snaps including plays that were not official because of penalties. I realize that sometimes on these blogs I don't spend enough time telling you what "good" is and I need to improve upon that. Today, let's spend a moment on the Average yards to go on 2nd Down. Last week, I said that the Cowboys had a nice low number on Average yards to go and someone was shocked to hear that averaging 6.1 on 3rd was actually very good. It is. So, allow me to say that on 2nd Down, the NFL generally averages about 7.9 yards to go. Now, keep in mind, it is because of all of the penalties and sacks and so forth that often make that number go up, but 7.9 or 8.0 is usually the number at the end of the season. So, the Cowboys again were at 7.0 this week, which means that they were way ahead of the chains and for the season have a 7.16 average yards to go on 2nd down which ranks them 5th in the NFL - and 2nd in the league for the best "2nd and 6 or less" percentage at 47%. Again, these are fantastic developments. This season, we're attempting to track both passing and drive progression. John Daigle has designed a fantastic chart. Each color, for instance, represents the possession number listed in the key. If you were to start from the bottom and work your way up, you would be tracking that possession from beginning to end. The dotted-lines are incompletions. 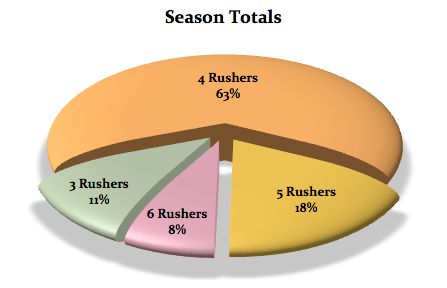 Large gaps between throws are mostly YAC or carries. Whether "statement" and "momentum" drives actually exist is topic for another day. For now, follow along the light blue possession. Wow. Look at these numbers compared to the last 3 years! Again, it helps to have a massive lead (vs Tenn and vs NO), but there is clearly intent to how the Cowboys are lining up and trying to maul you physically. Below are the season totals for past seasons, but thru 4 games in 2013, the Cowboys were at 61% with 151 shotgun snaps out of 246 total. This year, they are at 123/251. So, easy math there, in 2014 they have had 5 more opportunities, but have been in shotgun 28 fewer times! Pinch me. They finally are running an offense I have been campaigning for since Terrell Owens was on the team! So much dedication to balance and variety that there is almost nothing to complain about. It puts me in an odd position. In review, look at the Week 1 totals, then take only the last three weeks into account: 13/16, 203 Yds, 2 TD, I Sack, 8 FD. Amazing. I wrote a long piece in August about the Cowboys and the Run/Play Action Passing combo, and it might be worthy of checking again if you get the chance. It is really something how things clicked in the final 6 games of last year and they have kept going. The epiphany of the New Orleans humiliation last November and the bye week would be an amazing story to hear Jason Garrett tell some day. With Rob Ryan, it is never how often he blitzes (you will notice his blitz rate isn't shockingly high), it is how many he sends when he does blitz. He loves the big blitz with 6 and 7! Dangerous and deadly all at the same time. And Romo burned him on his own stove. 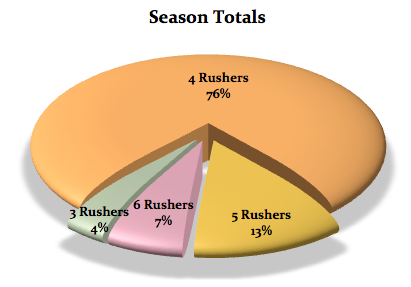 *These totals do not include the two instances New Orleans blitzed seven rushers. Thanks to John Daigle for his work on the charts and graphs. SUMMARY: Forgive me, but in the interest of time, I did not spend too much time on Tony Romo this week. In short, he was very, very good. He diagnosed blitzes, he made throws, he did not risk interceptions, and overall he was absolutely the type of player that looks like a QB1 capable of leading his team to a division win. Of course, there is so much more in that equation, but if your QB is at that level (and not nursing a back injury that is ending his career) then my fears of the last several months are quieting down. This was not the case after SF and Tenn, but these last 2 weeks have been "Top Shelf Romo". If he is going to do that, and if the zone blocking is going to do what we saw above, and the tactical decisions made by the man with the call sheet are going to remain on point, and if the health continues....the sky is absolutely the limit for this offense. I believe that they finally came to grips with the idea that they are not best suited for the Saints/Packers/Patriots template (and by the way, those teams are not as suited for it as they once were, either). Rather, the physical pounding style of Seattle or San Francisco which starts with a huge and powerful line, a running game that is unforgiving, and then when you adjust to deal with it, the aerial attack begins against a lesser-popualated secondary. It is physical, smash-mouth, toll-taking football and it wins in this league - in any era. It took us a while to get here and it won't always be sunny mornings and pretty flowers, but for now, you can absolutely see that the league is noticing some things on film that are going on down in Dallas. You are not relying on 1 guy to carry you. You are relying on 6 guys up front. And then, the next wave is a QB with lots of weapons. It protects your defense and it wears out your opponent. And if you study this offense over the course of many years, you know I am not always feeling this cheery about the Cowboys offense. But, I must confess, I haven't been this optimistic about the possibilities in a long time. The pieces are finally falling in place. Let's see how the league responds. It is difficult to measure what occurred last night in Arlington with any sort of clarity as it pertains to previous Cowboys' teams and similar victories to the 38-17 mauling of the New Orleans Saints. This 2014 side destroyed a favored contender in front of a national TV audience that expected anything but that result when the evening began. In fact, as the season has now turned 1 month old, you could certainly make the case that the Cowboys are, at 3-1, one of the surprising success stories of the young season (if, in fact, that means anything in the big picture). Most did not see this coming, and I will be the first to admit that I belong in that category of people who study this sort of thing closely and already might be willing to concede that I might like a "do over". The Cowboys victory was a rare thing in this era - a thunderous win over an opponent that was favored on the big stage of the national tv audience. Especially at home? A search for wins of over 2 Touchdowns in the post-Aikman era finds almost nothing to compare last night against, save for the 24-0 win over Philadelphia to end the 2009 season and to clinch the NFC East. But, even in that game, the Cowboys entered as the favorites. 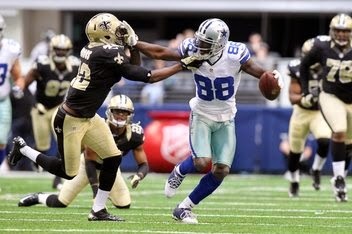 Regardless of whether or not this moves quickly to the top of the list of demonstrations of strength from the Garrett/Romo era, the point has to be that (before the Saints are discredited by those who wish to undermine the accomplishment), this win was about as attention-grabbing a win as the Cowboys have had in a long, long time - and for very good reasons. This is a team that does not destroy very many opponents that have a reputation for being legitimate contenders. This is a franchise that does not physically impose its will on its opponents. This is a fan base that almost doesn't know how to respond to something positive happening before its very eyes after all of these years. And from the open of last nights' proceedings until its drama-less conclusion, the Cowboys served notice to anyone who is willing to consider the possibility, that they plan on making this a much better season than the prognosticators considered possible. Whether they can actually pull that off is a discussion for another day, but today, we consider just how many ways the Cowboys crushed a team that is wandering back to New Orleans with all sorts of self-doubt about how good it really is. The biggest questions entering into this game were clearly about the ability to measure up to the New Orleans offense. Could the Cowboys defense slow them down a bit and more importantly, unlike in previous seasons, could the Cowboys offense actually demonstrate the ability to match up and produce on a night where they would have to do so? In other words, it is one thing to be statistically ranked in the conversation for having an elite offense. But, it is quite another to be productive on a stage where you must or you will lose - similar to the task in front of them in New Orleans, last November - something they failed at miserably. This offense, with its new coordinator Scott Linehan, absolutely has the attention of the league now. No matter how cynical anyone was about the Cowboys A) having the intention of running the ball and then B) having the ability to actually do that, we sit here on the Monday morning after Week 4 in the NFL and the Cowboys have run the ball more than any team, have more yards rushing than any team, and somehow average 165 yards per game on the ground. That makes them 1st, 1st, and 1st by NFL rank. Given that they ran the ball the 31st most of any team in the NFL in 2013 and averaged just 94 yards a game, hopefully everyone can forgive the cynicism, but many of us needed to actually see it to believe it. And again, the stats are nice, but what happens when the other team sits on your run and tries to make you prove it? Well, as you saw, 190 yards on the ground, and passes to defensive backs who had no safety support that ended up as touchdowns because the Cowboys receivers were taking candy from babies on back shoulder fades. It sounds so easy and yet the Jason Garrett designed offense has been talking about this for years and years and never come close to pulling it off. To hear Cris Collinsworth tell it last night, this was all a grand design to build a giant offensive line that took years of patience and understanding. In reality, it was massive salary cap mismanagement that had them gut their aging offensive line, but regardless, they now have a young and capable group that are running the zone stretch with such precision that Alex Gibbs is somewhere watching with tears in his eyes. Just look at the very first drive of the game - a 12-play, 80-yard masterpiece that we will study more on Tuesday. For now, know that there was a perfect blend of runs and passes, shotgun and under center, multiple personnel groupings, and a varied approach that saw positive yardage on 11 of the 12 plays and only saw 2 3rd Downs the entire way down the field. Those 2 seperate 3rd Downs were both converted on 3rd and 2 and 3rd and 3 passes to Jason Witten. Tony Romo looked athletic himself and with his new found running game doing what we hoped it would for years - take players out of the secondary - he dropped back with many options, all looking promising. They continued throughout the night with productive drives, scoring on 6 of their 10 drives and getting Touchdowns on 4 of their first 6 drives. It was amazingly effective with 8 3rd Down conversions and they got 7 all 3 times they were in the Red Zone. Meanwhile, about that defense. They were 32nd in the NFL last year and humiliated on national TV in New Orleans last season to the tune of 49 points, 625 yards, and 40 first downs. This time, they accomplished the 2 objectives that Rod Marinelli has stated for his defense. 1) get off the field on 3rd Downs as they allowed only 4 of 10 to a team that leads the NFL in 3rd Down conversions at 62% coming into the game. Teams don't get off the field against the Saints and the Cowboys did. And then, 2) take the ball away. The Cowboys had 3 takeaways on Sunday thanks to the playmaking trio of linebackers: Rolando McClain (forced fumble), Justin Durant (forced fumble and interception), and Bruce Carter (tipped pass for Durant's Interception). They needed players to step up and end drives by making plays, and the Cowboys linebackers are doing just that. And that should be impressive when you consider that linebacker is where the Saints and their offense were expected to attack most of all. It didn't happen last night, despite the yardage totals that were largely hollow. The Cowboys took the ball away 3 times and did not give the ball away all night. That +3 in the turnover margin is notable since in the last 25 years of Cowboys football, they are 33-4 when they are able to get to +3. Sometimes the narratives of the pre game shows and the talk all week are right on the money about how a game will go and then there are weeks like this one. So much talk about Jimmy Graham and Drew Brees and what the Cowboys would do against a "real opponent" after impressive wins against the Titans and Rams (for largely different reasons). Now, they destroy the Saints with Graham and Brees hardly factors at all and we then move on to reason why the Saints aren't very good after all. This type of logic fuels the league, but if you boil it down to our annual discussions at this time of year about which teams are actually good and which are only propped up by perception and myth, we arrive at the idea that no wins are impressive for teams you root against. Only a win against the Super Bowl champion at their stadium would impress some fans. Well, guess what? These Cowboys have a chance to go to Seattle in 2 weeks. As for my stance on the Cowboys, if that matters, I will tell you that I am not certain about whether there is sustainability here, as sometimes it only takes one injury to stop the train. But, they look like they have the pieces on offense to keep this going if health remains on their side, especially with Tony Romo looking like he is in a pretty good spot again with his arm and more importantly, his brain. The defense looks like it has very little flash, but an awful lot of intestinal fortitude and battle which can go a long way. It does appear that the depth is being tested and the injury news on Morris Claiborne is anticipated to be very bad (ACL tear) and would cap off a nightmare week for the young CB from LSU. Most expect that 16 games will reveal that this defense needs top personnel additions, but for now, they have certainly not let this team down through 4 games. And, with Anthony Spencer joining the side with DeMarcus Lawrence on his way, optimism is actually alive. The rhetoric today will be predictable. Many will mock the celebration as people getting way ahead of themselves, but I think it is reasonable to allow a team to be judged on what it has done. And, at 3-1, there is nobody saying this proves anything for the rest of 2014 - except that those of us who thought they might very well be 1-3 at this point might want to hold off on any declarations of imminent disaster. This team has put themselves in a very nice position as we head to October, and we know that with the exception of that trip to Seattle, they will spend the entire month at this very same home stadium. They will have an opportunity to deliver a message to Philadelphia that this division will be a battle all the way to the holidays and as San Francisco seemed to show yesterday, the Eagles may not enjoy a physical, grinding offense running right at them. In other words, it appears the plot might be thickening. But, let's pick 3 plays that are interesting but not played out by this point of the week and have some fun talking Xs and Os. Feel free to tweet me @SportsSturm when a game shows you a play that you would like broken down and I will attempt to include it in this post. This week, almost all of you agreed that we need to look at this first play, the Pick 6 for the Rams and Janoris Jenkins. We will also, below, study the huge 44 yard run that DeMarco Murray and the offense broke off, as well as the "winning TD" to Terrance Williams. Be advised that the long TD to Dez Bryant was already looked at on Tuesday, and the 4th and 1 stop by Hitchens and the Bruce Carter Pick 6 were handled on Wednesday. I really enjoy breaking plays down to see what we can learn. This is not good. And at the moment, it made you wonder if it was the beginning of the end. Not just Week 3, but maybe 2014, and if you squint, maybe the end of Tony Romo as we once knew him. As we look back, any reactions we had at the moment may have been hasty, but this is not the type of QB play that you can survive very often. Let's take a closer look. It is pretty basic Rams man to man coverage behind a 6-man pressure package on 3rd and long with a single high safety to address any major issues. That type of typical response to 3rd and long (a big blitz) is why you want to stay out of it as an offense. The Cowboys want 4 men in routes and that leaves only 6 in protection against 6 rushers. If your front can sort out the rush, then everything is fine, but once the Rams start twisting and disguising their rush, that is where QBs get tattooed waiting for their receivers to get past the sticks on 3rd and long. But, sometimes you cannot stay out of 3rd and long and you have to deal with it. To my delight, it appears in 2014, the Cowboys have finally decided to employ a tactic that has been used against them for the last several years. Say hello to the widespread introduction to rub routes! That is the new fun name for pick plays, but there is no better way to beat man-to-man coverages underneath than the criss-crossing routes that make it impossible to stay with your man through traffic. For whatever reason, the Cowboys were a few season behind on this, but perhaps Scott Linehan thought that was an issue (I am not sure I should credit every new advancement of this offense to Linehan, but I am simply noticing a lot of new ideas under his administration - and I like it). First, what did happen; if you are the Rams and it is time to discuss what the Cowboys like to do on 3rd and 8, the back shoulder fade to Dez Bryant has to be #1 on the list of things to look for (or #2 after the hook to Witten at the sticks). You will see that Janoris Jenkins is the only cover man not up on his man, but rather playing "off and soft" about 10 yards down field. Of course, he is sitting on the route, Romo turns his body to give another cue, and the second that Romo gets to the top of his drop, Jenkins plants his foot and drives on the pass. The back shoulder fade appears to be telegraphed and the ball location is not to the outside of Bryant, but rather slightly inside. This is all problematic. But, there is a bigger problem. on the inside route combination of Witten and Beasley, we see that Cole Beasley is all alone by himself in the middle of the field as Witten has occupied his man and Cole could walk to a 1st down. In fact, if Romo sees him, I estimate the gain is somewhere in the 30 yard range. 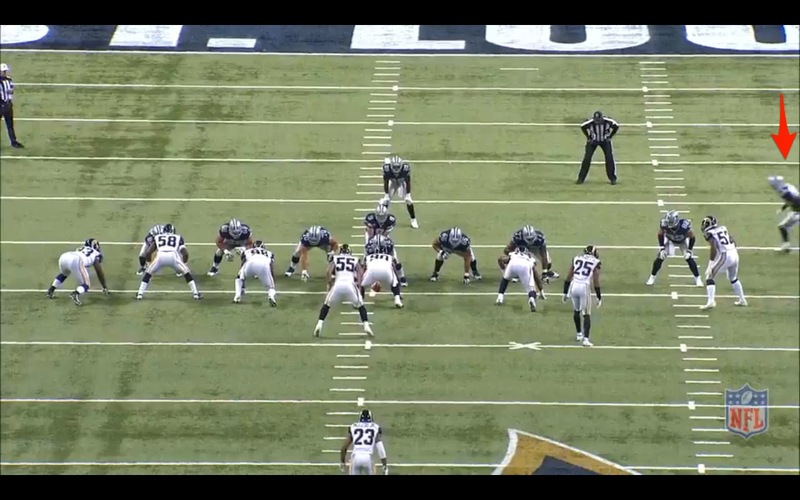 Once all 3 Linebackers vacate the middle and rush, this has to be where Romo is looking. Of course, it is fair to point out that if all 3 are not coming on the blitz, then they are looking to drop right into the passing lane of crossers and that is where LB interceptions happen. So, the edge throw doesn't have that to consider. Protection-wise, you can see above that the front 6 have done well in squaring things away. I cannot stress enough how impressive DeMarco Murray is at finding and eliminating the blitzers. I really think he is nearly elite-level in this department, and it doesn't get discussed enough. Romo needs to do better on this route, but as he said in the press conference, credit Jenkins for risking the house to jump this route. Later in the game, he would try it again and it would cost him a Touchdown, but this is the life of a risk-taking corner. It better fit the scheme or a team will not stand for that very long. If you follow this series, I would remind you that last week play #2 was also a pitch left to Murray that looks a lot like this play. You should check that out and see how the plays are nearly identical with just one major alteration. The fake that holds the linebackers last week was FB Tyler Clutts on a FB dive in the middle. 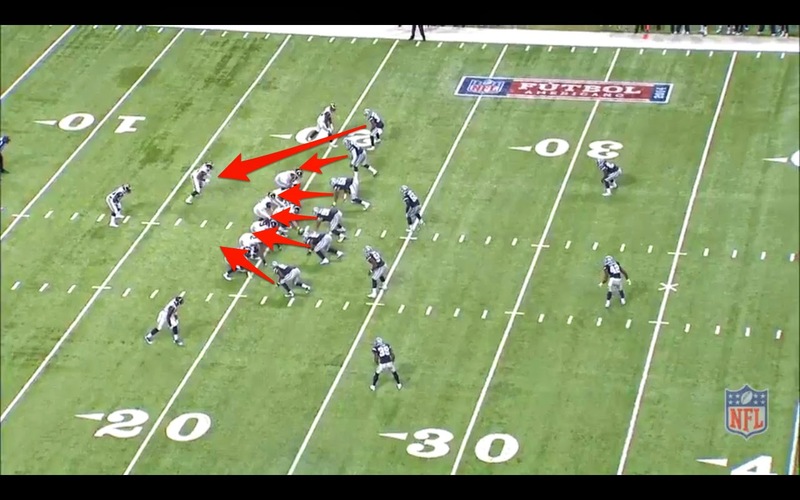 This time, it is a jet sweep to Dez Bryant crossing the formation to the offensive right. 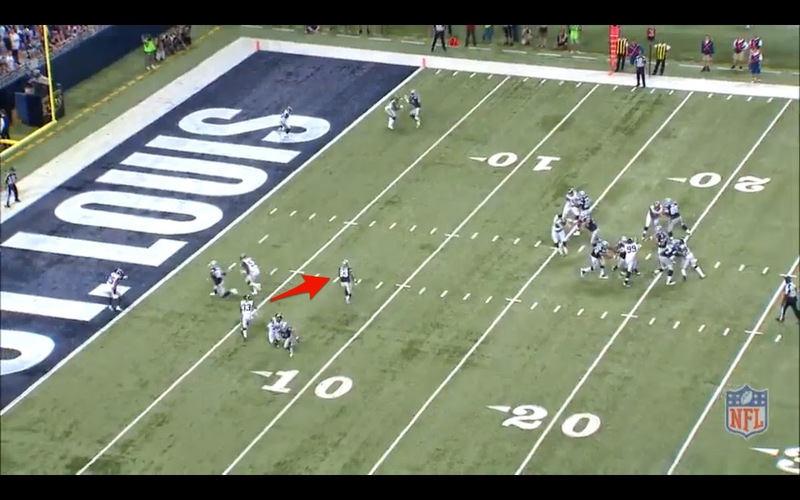 Above, I arrowed Dez and below I identified the Rams who are held by this fake jet sweep. In order to get the offensive linemen that step to out-leverage their men for a pitch left, you have to buy them a half count after the snap. And you do that with a fake. Clutts would not work every week because defenses look at that play and remind their players that Tyler Clutts never actually gets the ball. Don't fall for that! Well, Dez racing across the formation cannot be ignored. So, you can bet the Rams were paying that plenty of attention. The Cowboys look so sharp tactically this year. This time, Tyron Smith AND Ron Leary are pulling because the Rams are running their 4-3 with the 1 tech on the play-side. That means Leary and Smith only have the DE #97 on their side. Frederick has a much easier time walling off #90, with Martin joining him and eventually taking over on the combo block so Frederick can go look for more victims. If Witten can get to that DE with a down block (#97) and Harris then takes the man on Witten (#52), then the Rams are in trouble. Notice Harris above at the moment of the pitch. Also, notice how many Rams are still looking at Dez. Now, see big 77 and 65 getting out in front of DeMarco. Above, they both clean up DBs and Murray will slightly cut back and he is off to the races. So much so that Travis Frederick surveys the field in front of him and can't find anyone to destroy. Check the video below to see a few things: 1) what a great job Leary does. It looks easy, but when that play is happening and you are asking a big guy like Leary to get around the corner and clean up a dive-bombing safety, it is not easy. In fact, #25 just about ends this play at the turn and Leary does well to both get a piece and to not derail the Murray train. And 2) it is just fun to watch Frederick run in front of Murray and see that even though Frederick was a very slow runner on draft day with a 5.56 40, it appears he is surviving in the NFL. As I wrote in that draft write up 18 months back: On pulling plays, I actually like him in space (by center standards) and this is something the Badgers did plenty with their running game. He can handle himself well and is not the roadblock that you would expect with that 40 time. Again, a variation of a play that worked in Tennessee looks to be a real solid change-up of the simple zone stretch plays. The options are endless once you demonstrate you can run the ball. This is all very exciting. Again, I don't think you want to "man up" against the Cowboys this season. But, here, the Rams tried it and it was one of the easiest TDs you will see. 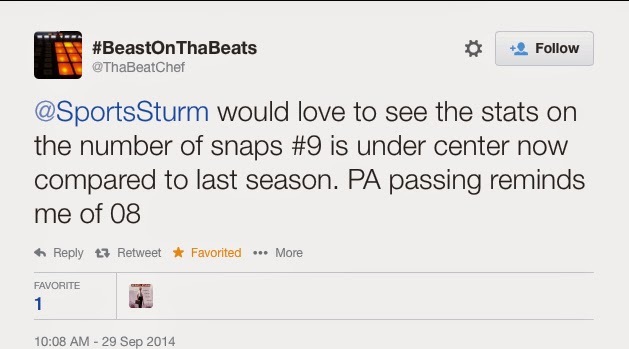 Let's look at what they want Romo to see in pre snap. 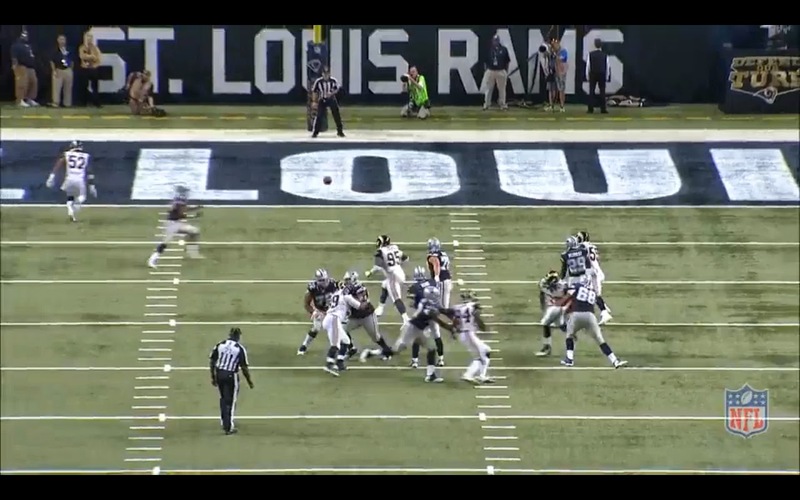 Notice in Frame #1 that the Rams are showing him the single-high safety. They do this because they want him to see Dez is in man at the top of the screen and then at the snap, the safety will head right for Dez and they will have a chance at another INT. Here, a few split seconds later, it almost looks like a different play. Romo is still yelling for the snap, but now they are in a Cover 2 setup. But, here is the cool part. The Cowboys are always expecting Cover 2 with man under. And Dez was never going to be the primary here. Also, notice that the Cowboys are doing what many teams do now with a "Beast" like Dez. They are employing the 3x1 conflict for the defense. If you want to double Bryant, then understand that you will be shorthanded on the other side with the 3 threats away from Dez. Detroit does this with Megatron all the time and we saw the 49ers do it with Vernon Davis in Week 1. If you want to key on their main weapon, then numbers say you can't have much on the other side. Now, above, look at the concept I really love. 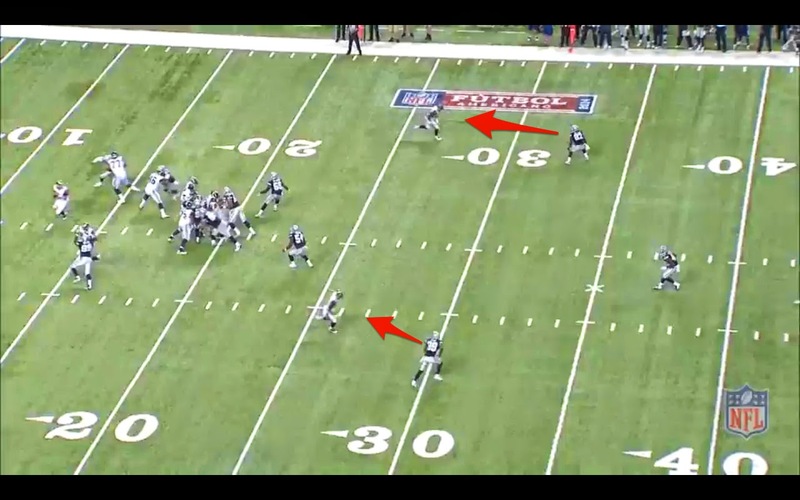 Once you see Cover 2, then you take Bryant and Witten right at the safeties to occupy them completely. Any opponent is keying on 82/88 on 3rd down or in the red zone. Let's use that against them. So, take 82 right at the safety on his side, leaving Williams and Beasley with their corners and that is where we run them at each other and see who loses their man. Above, it is clear. Beasley's out made Williams' man step around and there is your easy opening. Behold. A throw you could make. And there is nobody anywhere close to Williams. This is why they call the concepts, "man-beaters." I can't stress how this is going to trouble teams going forward. You must make Dez your focus, but not to the detriment of all of the other openings he creates. Again, this is why you wanted Linehan. Because he thought all of this through with Megatron. If these simple concepts were brought to Dallas and applied to Dez Bryant, what could be done with the entire offense? It seems that we are getting a better idea of what that means with each passing week. There are two ways to win football games as a defense in the NFL. You can either shut them down or you can make a few key plays. Now, surely, the preferred method is to humiliate your opponent into surrender by tossing them from sideline to sideline for 3 solid hours and laugh as you load the bus and travel to the next village to plunder. But, that is not necessarily an easy task - to assemble a defense that cannot be defeated. Seattle has done it, but usually, the league must take the other route to defensive victory. That route, where you hope you make just enough plays to get out of Dodge with a narrow victory despite damaging blows being landed on your face for much of the fight, was how the Cowboys defense left St Louis. "They played the Rams, dude." However, if you can make a play or two when it matters, and if your offense can answer the bell for a huge chunk of production, too - 340 yards + 119 in Rams' penalties - then you might have a chance to hop on the bus with your coveted win. You also need players to step up and be counted, and if there was ever a reason to be concerned about whether someone can pull their weight when called upon, it might be 4th-Rounder Anthony Hitchens who certainly has potential, but was largely untested before Sunday. I will never understand certain aspects of offensive masterminding when it comes to 3rd or 4th and a yard or less. If there is one thing that grinds my gears in these scenarios, it is an offense going backwards 7 or 8 yards before trying to get those precious 18 inches at the snap. Worse? Shotgun in 3rd and 1 or 4th and 1. Worse than that? Pulling guards which leave giant holes for LBs to come crashing through and to throw my RB for a loss. 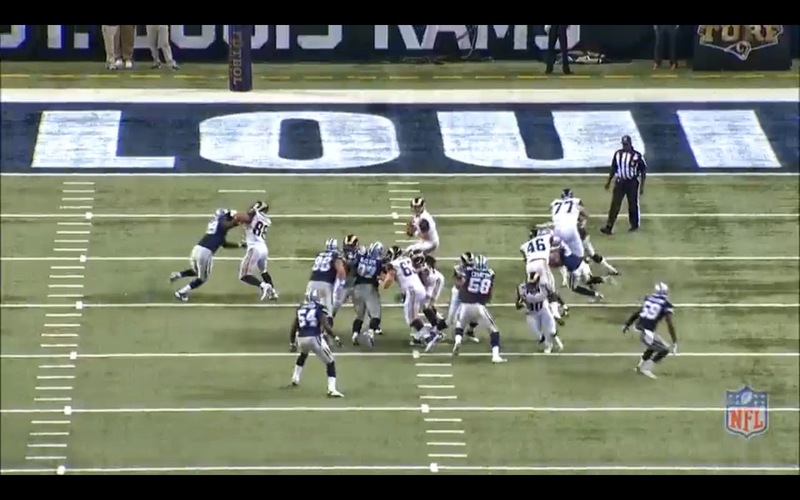 Here, the Rams decide to pull their RG with the Center blocking down on Melton. I get the idea, but what about Anthony Hitchens running right through that vacant spot in the middle of the line to blow up Zac Stacy? 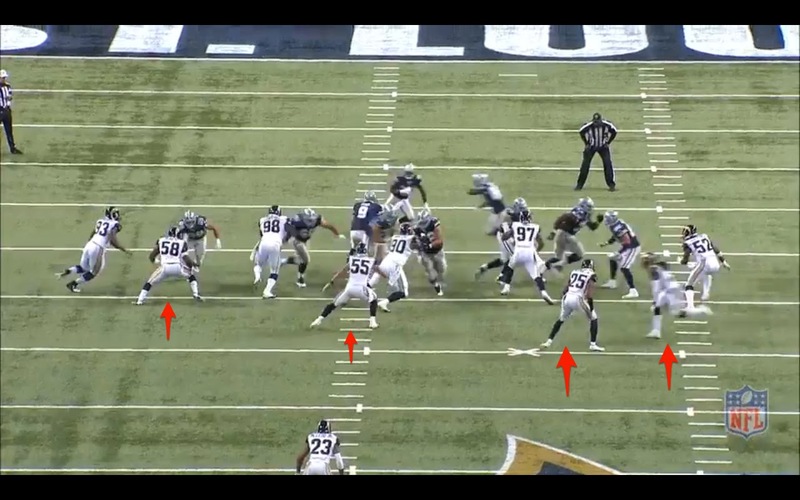 It also helps to have Jeremy Mincey and Terrell McClain not allowing for push on the left side of the Rams line. 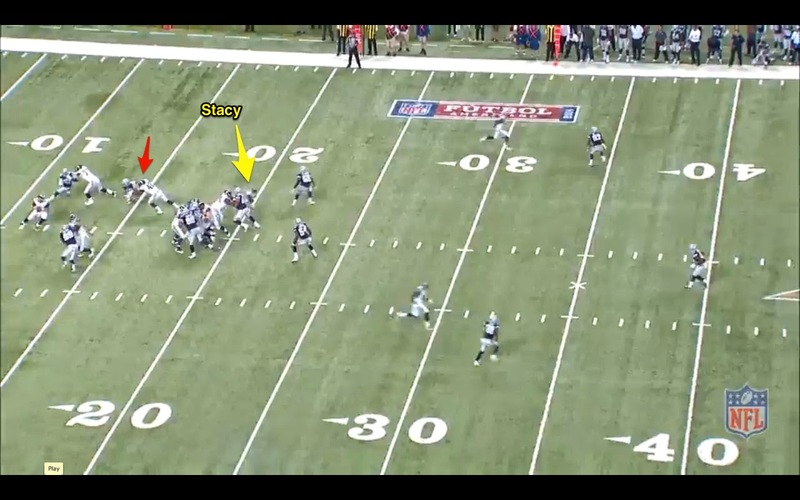 In fact, Mincey seems to toss 88-Kendricks right back into the path of Stacy. Then, the Pick 6. Surely, you know that 8 of the last 9 times the Cowboys have pulled off an interception and returned it for a Touchdown, they have won the game. The lone loss in this scenario that goes back to 2009 was Sean Lee's Pick 6 last year in San Diego. Get a free TD from the defense and they generally win. First, it came from Bruce Carter, a guy I have been critical of in the past, but I am also linking to any chance this defense has in 2014. Rod Marinelli must get Bruce Carter and Mo Claiborne back to what we thought they were to have any chance. The Claiborne developments of the current news cycle are most disturbing, but through 3 games, I think Bruce Carter is back in reasonable form. That doesn't mean he is perfect, by any stretch. But, on Sunday, I thought he played pretty well overall and showed some real intestinal fortitude in the 2nd half when he was absolutely banged up from a shot to the head, it appeared. But, he also made a fine play here and maybe earned the win. 4th Quarter. The Cowboys have finally pulled ahead and this is the very first play of the Rams next drive with 6:06 to play. Marinelli calls in a 6 man pressure with a Cover 1 behind it. 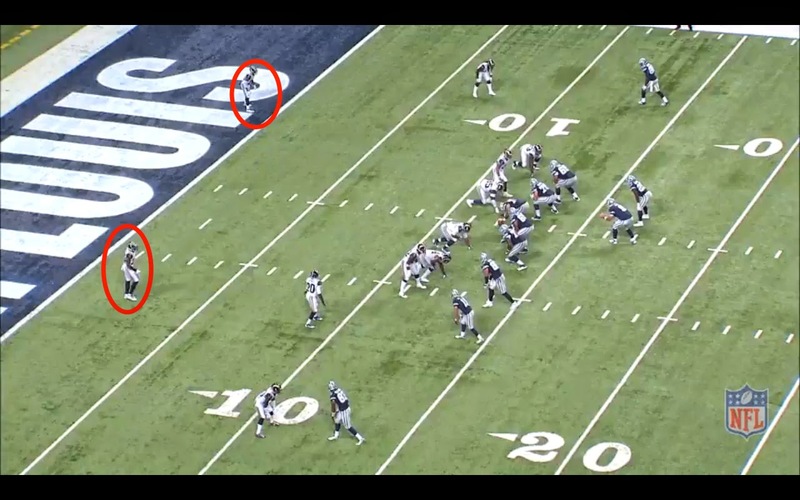 Scandrick is showing press coverage to the top, but that is his blitz position and Wilcox has his man behind him. 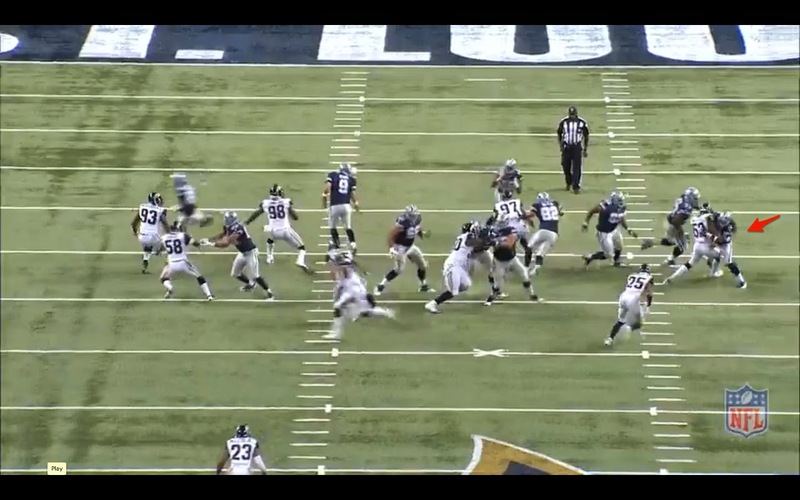 6 man pressure, but neither Carter or Hitchens are coming from the middle. 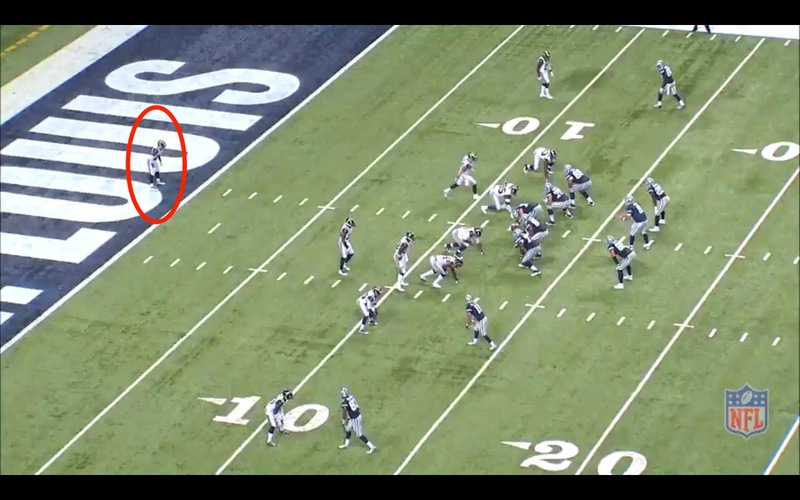 You can see Hitchens is on Stacy, with the FB staying in to get Scandrick. That means Carter can float and play more of a robber/QB spy role by standing his ground and trying to get a feel for where the play is going in the frame above. Now, Stacy is sneaking out and turns Hitchens around making the QB think this is going to be his read. 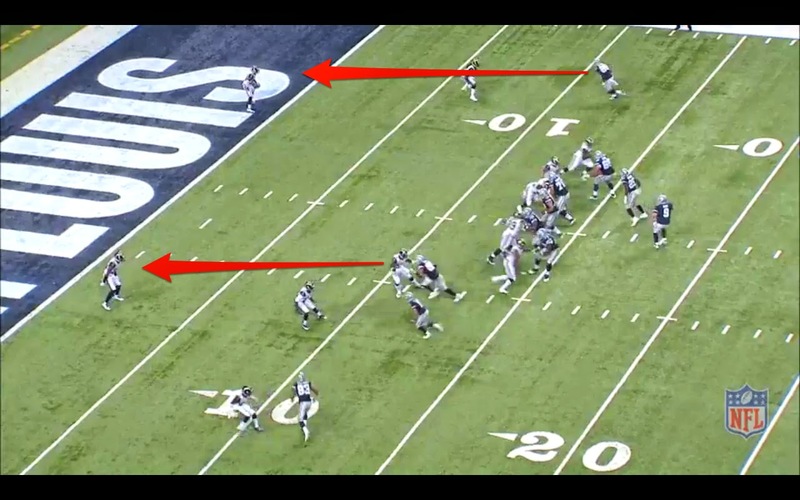 The red arrow shows Scandrick speeding past the FB 46-Harkey. As you can see, amidst the pressure, Carter is almost Hidden from Davis, and he is just going to throw Stacy to daylight over the converging pass rush. And that is where Carter sniffs it out and makes the play. Fantastic job of lurking and then pouncing at the moment of truth. How many times does this ball hit a LB in the hands and fall to the ground? Those two plays and then Claiborne shuts the door with his pick later get a win in a game where the defense could not get to the QB and were allowing long shots down the field all day. Honestly, as impressed as I was with Austin Davis, there is no doubt that a better QB could have found 500 yards easily. Brandon Carr had his guy - Kenny Britt - get behind him a few times and Davis just missed on the throws. The defense must be better than they were on Sunday in many regards, but they got away with it, largely because of the 2 plays above. DEFENSIVE PARTICIPATION: - The biggest news is the return of Orlando Scandrick and the absences of Justin Durant and Rolando McClain for what we assume is merely a short spell. Davon Coleman was also out with an injury. The defensive rotation kept everyone at Nick Hayden's 51 snaps or below. Mincey 50, Crawford 46, and Melton 40. Terrell McClain had 39 and George Selvie 37. Beyond that, Keith Smith played 2 snaps when Carter had to leave the game, but the back 7 was pretty predictable with Scandrick taking some Claiborne work and Sterling Moore after his great game in Tennessee played just 3 snaps. Thanks, Pro Football Focus for the exact math. You cannot give up 6.2 yards a snap for 72 snaps and allow 8 3rd downs and a 4th down conversion and live to tell about it very much. Lots of troubling production allowed. Bruce Carter and Anthony Hitchens had busy days. They were attacked plenty and no doubt woke up on Monday quite sore. But, they also played and competed very hard and were productive at time. That is all you can ask sometimes. Though it's displayed in the Blitz Report near the bottom, the passing chart further indicates Dallas' current preference to remain in coverage rather than blitz. * - Edit: The Carter interception was actually a 6 man pressure. E-Bob. 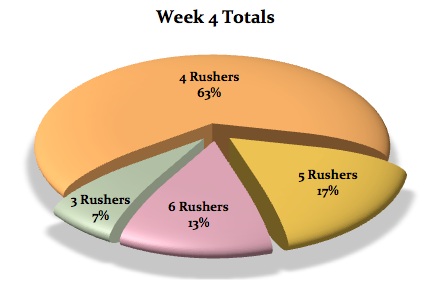 Each week we monitor how often the Cowboys will send pressure on passing plays. 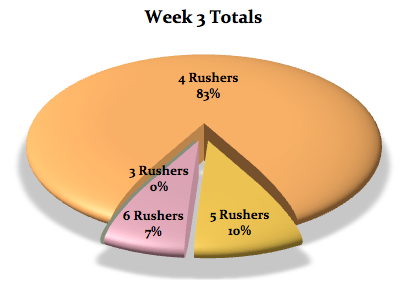 Week 1 showed an aggressive defense trying to get the ball back to attempt to generate a rally. The scheme and the personnel call for limited blitzing and playing coverage to protect the soft personnel. Marinelli has to be very selective how he employs the blitz and did a very fine job at times on Sunday. SUMMARY: Well, it is certainly difficult to summarize the defense in such fragmented fashion. They clearly cannot generate enough pressure up front with a pass rush, but they are trying to remain optimistic that a healthy Melton and the returns of Anthony Spencer and DeMarcus Lawrence will help. I will also point out that George Selvie is losing plenty of time to Tyrone Crawford, which might not be a bad thing, but Selvie was your best pass rusher and Crawford seems to get close but never quite gets there in time. Is there a way to get both out there? Maybe in nickel, but so far it doesn't happen too much. Meanwhile, the elephant in the room is the developing story of Claiborne who apparently walked out of the team facility with his belongings after being told on Tuesday that his role is being flipped with Scandrick. Many of us have projected this move for sometime, but his response was not expected. Cornerbacks, above almost all others, need to have a fighting mentality and a determination to shake off a bad experience and compete even harder. His walking out posture is most disturbing and you wonder if he can rally from where he currently is. You can have all of the tools in the world, but if you don't have the internal battle the tools won't help you. Scandrick has made a career because he is a relentless fighter who takes everything personally, and it drives him to win the next battle. Tapping out is quite disturbing and perhaps telling of a bigger issue that we don't know about. That said, as a defense, I think you treat it as if he is unavailable. He must be deactivated for Sunday and that sends a message in the room of accountability and playing for each other. I think this is a pretty big team-building moment that has arrived on the door step. But, give me Scandrick and Sterling Moore right now who both will fight until they can't fight any longer. That is all well and good, but now the Saints roll in to expose any weaknesses. The last time these two teams met was the low-point in 2013. when New Orleans rolled up 625 yards and likely could have had even more if they were interested in doing so before they called off the dogs. A Sunday night without a pass rush will be lethal. But, do you dare blitz Brees and expose men in coverage against a team that hopes you do just that?